As of Scars of Mirrodin, there are only eighteen imprint cards in Magic. That's not so many cards, but imprint cards are hard to make. I know this because I was on the development teams of two sets that included imprint—Mirrodin Besieged and "Action"—and we had to look hard to find designs that were fun, interesting, and balanced. You might have been able to guess that based on looking at Scars of Mirrodin and seeing that there are only five imprint cards in the set! Why is it so hard? The first reason is text length. Each imprint card requires a line of text explaining how a card gets exiled, then a second line of text that references it in some way. That's two sentences, each of which may take two or three lines in the text box. That doesn't leave much room for the cards to do anything else. As it happens, the only two imprint cards that have any text other than those two sentences are Equipment, and the only other text is the equip ability. Because of this, imprint cards must be pretty simple in terms of their basic idea to fit inside an actual Magic text box. The other challenge is referencing the exiled card. 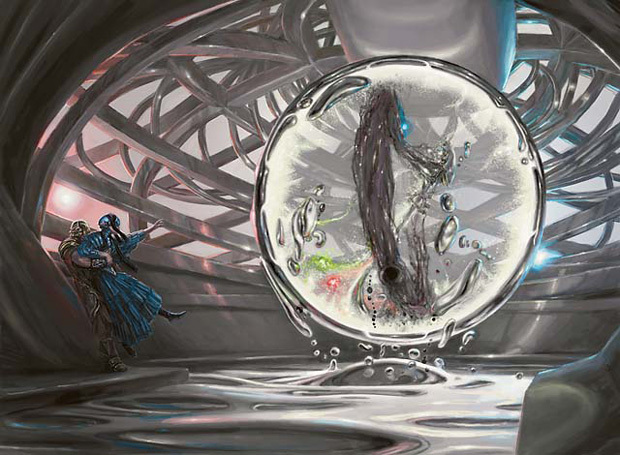 Mirrodin established that imprint cards must reference the characteristics of the card in some way, and there are a limited number of ways to do that in a way that makes sense. The fact that there is also only room for seven or so lines of text between the two required abilities also removes some possibilities. Scars of Mirrodin block is a sequel to the first Mirrodin, but it is not meant to be identical. Imprint is a part of Scars to provide continuity with things that players recognize and like from the previous incarnation, not to steal the spotlight, so five imprint cards in Scars of Mirrodin felt like enough. Rather than try to squeeze an article out of those five cards, I'm going to go all the way back in time and talk about each imprint card in history that randomly strikes my interest. Here goes! Chrome Mox was a smashing success from a development standpoint. It's a Mox, so there was a lot of buzz around it when Mirrodin released. It was strong enough in Constructed to maintain that excitement through Chrome Mox's run in Standard. It was also not so strong that every deck was supposed to play four of it, and people did their best to squeeze Chrome Mox into several decks that probably didn't want them. I don't think I could have written a better story about a card if I tried. This card is an obvious homage to Mox Diamond, a card that was often misunderstood in its time. Both Chrome Mox and Mox Diamond have an effective additional cost of a card—in Chrome Mox's case, it's the card you imprint on it. Everyone wants their cards to let them "cheat," but these two moxen have deck-building costs. Mox Diamond requires you to discard a land, which means that you can't just cut lands for Mox Diamonds. When I play Mox Diamond in a Cube draft, I've learned to treat it as though it takes up a spell slot in my deck, but that's unintuitive to many people and not particularly satisfying. I'm much happier with Chrome Mox, which makes perfect sense as a replacement for a land in a deck. Because the card that it costs you must be a nonland card, you don't have to change your total count of mana-producing cards, so the instinct to cut lands for Chrome Mox is correct. I like this much more. While thinking about Chrome Mox, I realized something that I found remarkable. In different tournament decks, I have played one, two, three, and four copies of Chrome Mox and felt afterward that the number played was correct. I have played the full four copies in mono-red attack decks that valued speed, in base-blue Extended decks that played Thirst for Knowledge, and in speed combination decks. I have played three and two copies in decks that wanted a moderate burst of speed and could handle a small amount of card disadvantage. I once played exactly one copy in a Luis Scott-Vargas-built Doran, the Siege Tower-based deck that wanted just slightly more mana-fixing but couldn't afford to draw two copies. I think it's pretty cool that a Mox ended up in that space instead of just being a card you play four or zero of all the time. There was a little bit of internal strife about whether or not this card conformed to the rules of imprint. Why, some people asked, does this get the imprint ability word when it barely matters what the imprinted card is? The answer is that just before the creature enters the battlefield, Clone Shell checks that it is, in fact, a creature. That's not much, but it's enough. This card is beautiful. It is clean and simple, and it's powerful enough to have seen play in several Constructed decks that were happy to cheat it out through Tooth and Nails or Goblin Welders. I have always wondered why it is a base 2/4, though. While researching this article, I realized that I now have access to the Multiverse card database, so I could find out. Unfortunately, no one seems to have explained that particular mystery. Some things are lost to time, and I suppose this is one of them. I am not sure if Isochron Scepter is regrettable or not. It is fun to think about, but often not fun in play. Ken Nagle has an Isochron Scepter-based blue-red casual deck that often causes people to refuse to play with him as all their spells get countered and all their creatures get burned with no hope of a better fate for future spells or creatures. I once played Scepter-Chant in an Extended Pro Tour Qualifier, and I'm not sure anyone involved had much fun. Teferi, Mage of Zhalfir combined with an Orim's Chant on a Scepter is a hard lock, but that doesn't mean you've won the game. Often, my opponents would be locked out of doing anything, but I would struggle to find a way to kill them, a process that would frustrate both of us! A more tyrannical development team might have killed this card, understanding what would happen if it were printed. I'm not sure whether doing so would have been correct, but I would sympathize with someone who did. On the other hand, the card is still desirable eight years after it was printed, and it was cool enough to make it into a From the Vault, so it clearly hit some nerves. I suppose I am happy to have this card as part of Magic's history, but glad that it's not in Standard to hang out with Silence. Mimic Vat is just about as cool to think about as Isochron Scepter for me. Unlike Isochron Scepter, though, this card is totally awesome in play as well. Not a lot tends to go wrong when there are creatures attacking and blocking, and there's lots of interesting upside potential. It's cool enough to just make creatures and attack, but there are plenty of creatures with juicy "enters the battlefield" triggers to use over and over again. The most popular way to use Mimic Vat in Standard that I've seen on Magic Online is to use it with Allies, which give you all kinds of bonus triggers on top of the trigger from the copy you make. I've been mildly annoyed when playing against Mimic Vat in these decks, but never for very long. If things are really going off with it, I usually just die in a few turns. That's a good space for a card that could produce repetitive game states to live in. Speaking as a developer critiquing a design, this card is almost infinitely more satisfying than Isochron Scepter. There's no limitation on the craziness you can achieve with it, there's a reasonable up-front payment that ensures that it won't get online in the earliest turns of the game, there's time for an opponent to deal with it before it starts going off, and it can't be used at instant speed, which keeps countermagic from being reused. I suppose I only wish that this card were more powerful, as the world might be a happier place if this were the imprint card that we all remembered. There was some amount of discussion about whether or not this card should count opponents' copies of the imprinted card. I think it's cool that we decided that it could, but experience suggests that this is not intuitive to many people. At both the Scars Employee Prerelease and the Employee Appreciation Week Scars Sealed Deck event, I won games because my opponents weren't aware that their Strata Scythe was counting my lands. They could have equipped their Scythes to flyers and just killed me, but they didn't. It is possible that we went the wrong way on this card, especially if we could have shaved a mana off of the card somewhere. Remember the discussion about Clone Shell above? I am told that exactly the same discussion happened about Summoner's Egg, as they are very similar cards. Magic Ramp;D does not like to repeat mistakes, but we seem to be quite fond of repeating arguments! Do you plan to buy Premium Deck Series: Fire amp; Lightning? I am slightly jealous of those of you who said yes. I've been looking forward to getting my copy of Fire and Lightning as an early Christmas present to myself, but the Wizards employee store won't be getting it in until early next year. Soon, however, I will join you in your ownership of foily red cards. I look forward to the red cards in my cube getting much shinier. 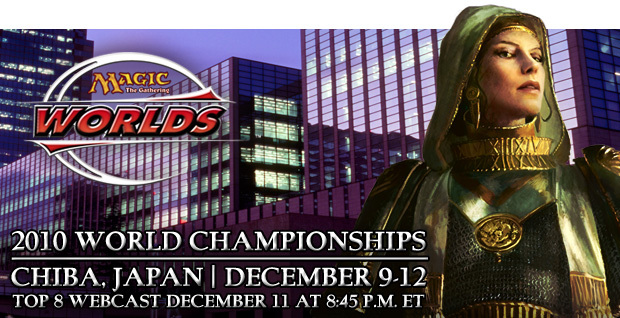 Have you attended a Pro Tour or World Championships event? Yes, and I have played in at least one Pro Tour or World Championships. Yes, but I did not participate in the main event. No.